Bonn, 09/04/2018 Sustainable development is the fundament to preserve our earth for present and future generations by finding a balance between the need for socio-economic development and the protection of the environment. These topics of global political relevance demand international research cooperation. With its high-class innovation and research centres, Germany supports great efforts in particular by intensifying international cooperation among the bright and outstanding minds of tomorrow. 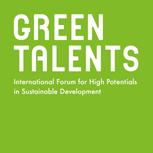 For more information please refer to our website www.greentalents.de where both, the competition flyer as well as the award trailer are available.